The following diagram shows how to graph complex numbers on the complex plane. 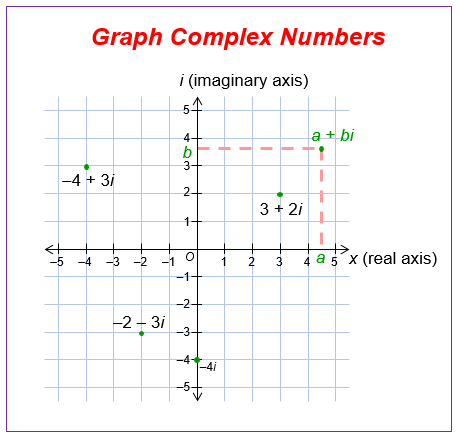 Scroll down the page for more examples and solutions on how to graph complex numbers. Imaginary numbers arise frequently in mathematics, but in order to do much with them we need to know more about the complex plane and the rectangular form of complex numbers. The complex plane is a medium used to plot complex numbers in rectangular form, if we think as the real and imaginary parts of the number as a coordinate pair within the complex plane. In this video we learn to graph complex numbers using the complex number plane (instead of our normal x-y plane).